Photomontage is a technique that has long been used by artists to create new visions of reality. Its use can be traced back to the origins of photography; double exposures and cut and pasted layers were common enough even in the beginning. In the modern era, it became especially prominent in the Dadaist work of John Heartfield, Hannah Höch and others, remained popular with many Surrealists. It had a resurgence in Pop Art of the 1960s and its architectural offshoots like Archigram and Superstudio. And as digital technologies evolved into the 1980s and 1990s, it was used by photographers like Andreas Gursky, Jeff Wall, and Thomas Ruff, who is his series, Häuser (1987-1991) erased windows and composited digital images to create unknowable and hyperreal spaces. Photomontage has also long been central to the rendering of architectural projects. Photographers Filip Dujardin and Lauren Marsolier inherit this legacy of photomontage and are currently exhibiting in California. 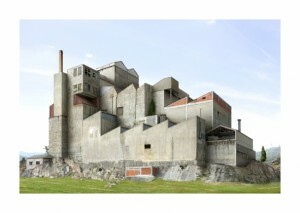 Highlight Gallery San Francisco features new work from the Belgian photographer, Filip Dujardin. 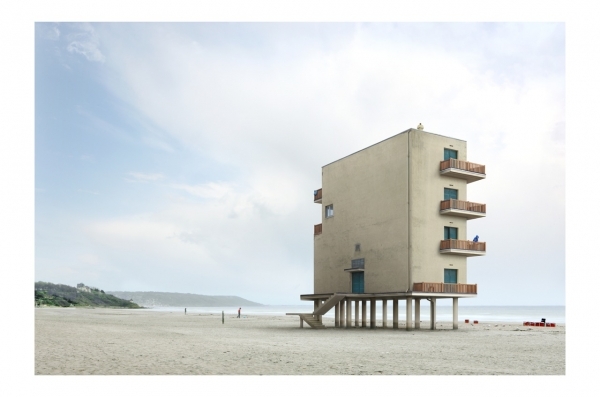 Dujardin’s (Dis)location pairs selections from two recent bodies of work; Guimaraes: The Photographic Mission: The Transgenic Landscape and Deauville: Architectures Imaginaries. These projects resulted from residencies in Deauville, France and Guimaraes, Portugal respectively. Dujardin’s works create an archive of buildings and architectural fragments and he experiments with their formal possibilities in fantastical ways. His work pushes the margins of architectural photography by playfully exploring the possibilities of stacking and slicing by creating images of impossibly multiplied building forms. He is a remix artist for buildings by repeating and transforming architecture. The images are not bound by the psychical nature of actual buildings or by the constraints of force, gravity, and shear faced by architects and engineers. There is one reading of this work as utopian, as the willing into existence of previously unthought-of forms. However this is probably being generous as the photographs seem more formal and sculptural, satisfied by their ability to trick the eyes and please the mind. While the French city of Deauville offered more familiar modernist buildings for Dujardin, Guimaraes presented him with more historical forms. 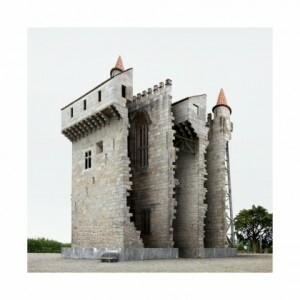 In previous bodies of work Dujardin has mostly used modernist forms and fragments, however here the centuries-old castles became a rich vein of new forms to explore. 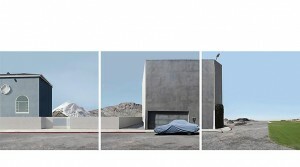 (Dis)location’s combination of works showcase two clashing environments and multiple building styles, however the title owns this contradiction by locating viewers both in the no-place of architectural fantasy and the interstices of distinct geographical places and cultures. The act of dislocation is also the act of removing reality from the photograph. These spaces are not inhabitable but appear hazy in front of viewers, held just at arm’s length, out of reach. The constructed spaces are a nowhere place of dreams and fantasy. Maybe it is the buildings dreaming of becoming something else. The dreamlike quality of these images is an essential component of photomontage and is one of the main reasons that the technique has remained popular throughout the history of photography. In his most fantastical images, he loses the magic moment of truth, the largely unconscious process of “is that thing real?” Some of the works are too clean, and when the images are immediately read as unreal instead of held in transition by the viewers’ suspension of disbelief, the effect is lost. There is a fine balance needed to trick the brain and to elicit a positive response of the viewer. His popularity points partially to the successful execution of this world-building procedure for his viewers. For comparison it would be helpful to contrast Filip Dujardin to photographer Lauren Marsolier. 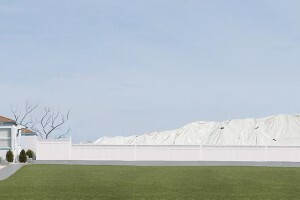 Lauren Marsolier is a contemporary photographer who also works in photomontage. Marsolier’s ongoing series Transitions, which just opened at Robert Berman Gallery in Santa Monica explores the phenomena of transition. Marsolier probes the effects that a change of view can have on emotional, perceptual, and spatial awareness. She explores this question of transition both as a psychological force and as a spatial condition. Her concept of transition is framed by the loss of the solid grounding of the ideologies of the past, the implosion of clear boundaries, and a sense of placelessness caused by collapse of stable signifiers. Her works contain subtle juxtapositions of location, mismatching the foreground buildings and background landscape. The scenes are calm, even serene but discomfiting, too quiet to let viewers guard down. The works’ content, mostly of buildings and deserted landscapes are quite eerie. There are commonalities between Marsolier’s and Dujardin’s approaches. 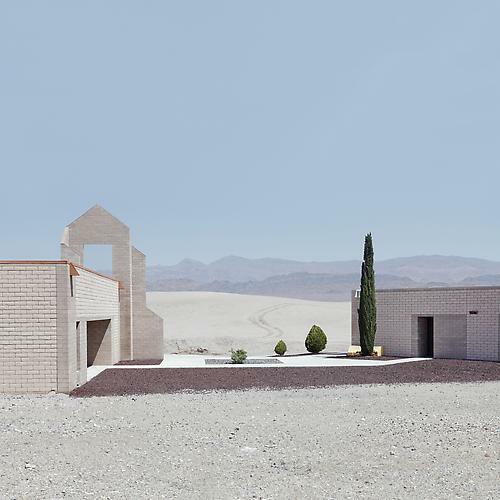 Their images share a similar flatness where buildings are isolated from their background environment. Cloudless bright skies feature in almost all of Dujardin’s work as it frequently does in Marsolier’s Transitions. In previous works, however Marsolier has shown more versatility, experimenting with night shoots and varied lighting conditions. Another key difference is that her photography comes from a landscape tradition whereas Dujardin is primarily an architectural photographer. There remains the question of what is the function of a contemporary photomontage. The bigger question of understanding the aesthetic of photomontage is the question of affect. Is it enough to ask “Am I seduced by this image?” Is optic seduction enough or is there a need to strike other sensorial places or imply deeper questions? Marsolier says she is aiming for this transitory place in her images. They are transcribing feelings and reaching into an uncanny space by making the void of post-modern life visible. For Dujardin is the experimental catalog of forms and the sheer visual pleasure of seeing them enough or is the very act of making fantastic forms actually creating a vision for the future?